Taking your bike abroad can be stressful, with plenty of things that can go wrong including lost or damaged bikes or parts to add to your travel stress. The ULTIX Saturn wheel bag takes transporting your wheels to the next level, providing a secure but lightweight method of transporting your wheels whether you're taking them on a train, plane or a long drive. The Saturn is made from durable nylon material which makes it super lightweight, with a shoulder strap to make carrying them around easy. To keep your wheels safe the bag features a padded hub-protector to provide extra security for the most important part of the wheel; meaning you don't even need to remove the skewer or deflate the tire to transport them. Whereas bike boxes rely on plastic to protect your machine and components - which can break easily upon impact - the Saturn uses self-inflating air pads that insert either side of the wheel bag, working with a foam inlay to provide high levels of protection without the added weight. A double YKK zipper and TSA approved padlock provides extra security for the wheel bag, meaning you won't have a problem at customs or with baggage handlers. The modular design allows several bags to fit together, making it a great option if you are travelling with several sets of wheels or if you're travelling in a group to keep all of your wheels secure together for extra protection. The Saturn is a versatile wheel bag that can also be attached to backpacks to make carrying them even easier. Catering to inflated wheel sizes up to 26 inch to include almost all variations of cycling, the Saturn can be folded down into an inner pocket to make it easily stored when not in use to save space in your home. 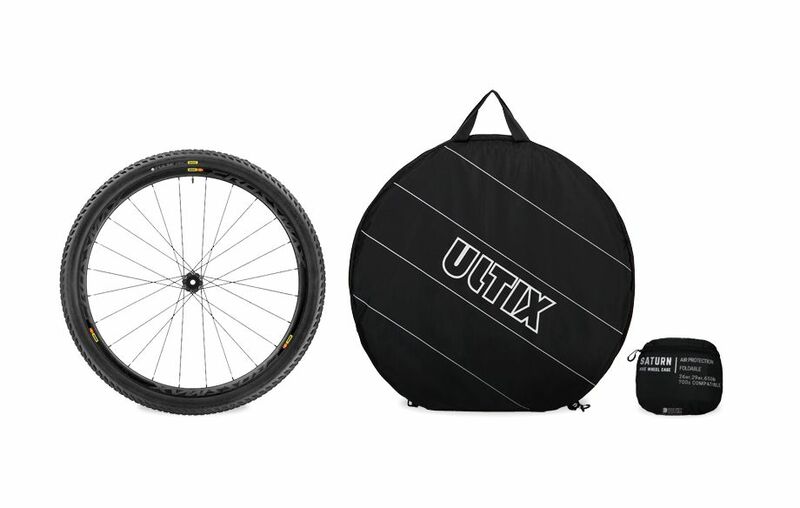 A design spokesperson from ULTIX said: "There are many kind of wheel bag on the market, such as full covers, sponge protected versions, double and single wheeled versions, ones exclusively for mountain bikes or road bikes." "What I couldn't see, so what we created, was a versatile wheel bag which fits different modes of cycling, models of wheels and uses for travelling and storage. The Ultix Saturn meets all of these criteria; it is easy to carry and use and will help save time and money." The Ultix Saturn is currently being crowdfunded on Kickstarter and is expected to ship in February, meaning you can have them in time for your spring training camps to test them out in transit.